We are in the home stretch now of the hardest three weeks in sports. For the human connections to a thoroughbred chasing the elusive Triple Crown, the 21 days between the Preakness and the Belmont is when the quest truly becomes difficult. When the pressures mount. When the scrutiny intensifies. When the joy ride teeters on the verge of becoming a forced march. I'll Have Another and his people are at that stage right now. Since the colt dramatically ran down Bodemeister in Baltimore May 19 to complete the first two legs of the Triple Crown quest, the list of what's gone wrong is a lot longer than the list of what' s gone right. • New York racing stewards said they will not allow the colt to wear the nasal strip he wore in winning both the Kentucky Derby and Preakness. • I'll Have Another's regular exercise rider, Jonny Garcia, missed more than a week of working with the horse when visa issues delayed his arrival in New York. Doug O'Neill had to borrow an exercise rider from fellow trainer Todd Pletcher for a while, then brought in another one of his riders from California while waiting for Garcia to get his license to ride in New York. • I'll Have Another – and the 10 other expected Belmont Stakes horses – were ordered to report to a detention barn starting Wednesday. (O'Neill said he'd beat the rush, getting his colt moved in Monday.) They will stay in that barn through the race, theoretically under greater security and surveillance. Trainers involved are not happy with the change of routine and surroundings for their horses. • In a true heart-stopping moment during morning training hours last week, a runaway horse that dumped its rider nearly collided with I'll Have Another. The horse brushed against Garcia's boot as he was guiding the star of the show onto the track for his gallop. A collision could have been more than just cataclysmic in regard to this race – it could have been fatal. Only in the tone-deaf world of horse racing would a sport desperate for publicity choose the one moment mainstream America is paying attention to take its newest star off-radar for two weeks. Fortunately for racing, O'Neill has been more than willing to shoulder the publicity burden. • But not all publicity is good publicity. In a perfect example of tortured racing jurisprudence, O'Neill has been suspended for 45 days for something that happened two years ago. The suspension doesn't take effect until July 1, and the language of the ruling almost exonerates O'Neill while simultaneously finding him guilty. O'Neill has been fined four times and currently faces the July suspension because one of his horses was found in 2010 to have an excess level of total carbon dioxide following a race – frequently a sign of an illegal practice known as "milkshaking." However, the California Horse Racing Board agreed with O'Neill that the horse in question had not been milkshaked. The board did not indicate what might have caused the excess level. O'Neill, who also has a higher-than-average incidence of breakdowns for his horses, according to The New York Times, was pleased to be cleared of the milkshaking charge but nevertheless will pay a hefty price with the lengthy suspension. • O'Neill was publicly criticized by the woman who is basically the Queen Mother of racing, Secretariat owner Penny Chenery. She said IHA owner J. Paul Reddam "should be embarrassed that the trainer he has chosen does not have a clean record." O'Neill took the high road in response – "It's disappointing because of how much respect I have for Mrs. Chenery," O'Neill told reporters. "I would love to have her hang out with me for a week and would stress to her, 'Don't believe everything that is written.' " – but that had to sting. • Reddam's own path to riches has come under scrutiny. Bloomberg News reported after the Preakness that Reddam's loan firm, CashCall, has come under fire in three different states. West Virginia charged CashCall with violating state usury rules (usury is the practice of charging excessive interest rates on loans) last October, with a ruling still being awaited. CashCall settled a case in California by paying a $1 million fine. And Maryland has proposed banning the firm from its state, having previously fined it $5.7 million. Throughout the maelstrom, the one consistent piece of good news has been the horse itself. By all accounts, I'll Have Another is training well and doing everything right in the lead-up to Saturday's Belmont. But nobody will know for sure how ready I'll Have Another is for this final test until the starting gate opens Saturday evening. Or, more likely, until the colt hits the sweeping far turn and sandy stretch at Belmont Park. Then we will know whether O'Neill deciphered one of the toughest tricks in modern racing. Since Affirmed last won the Triple Crown in 1978, 11 horses have won the first two legs and faltered in the finale – many of them more accomplished than I'll Have Another. The hardest three weeks in sports tripped them up. Winning the Kentucky Derby is the pinnacle achievement in American thoroughbred racing, and the two-week span from Derby to Preakness tends to be pure bliss for the people involved and low-maintenance conditioning work for the horse. Trainers have said that if the winner of the Derby is a deserving champion and not simply the beneficiary of significant racing luck, it stands to reason he will win the Preakness as well. His conditioning cannot be compromised significantly in 14 days, which means that if he was dead fit on the first Saturday in May, he'll be dead fit on the third Saturday in May as well. That's why we see so many winners of the first two legs. But then the equation changes. For everyone. The horse is unlikely to stay on autopilot for another three weeks, which means the trainer must strike the proper balance. He must weigh the need for a fresh horse for the 1 ½-mile endurance test of the Belmont against concerns of babying the animal and losing his edge. O'Neill has opted against a full-blown workout between the Preakness and Belmont, going instead with long gallops. He's made the right move every step of the way to this point, but history shows how difficult it is to get to the finish line victoriously. Asking modern thoroughbreds to run three grueling races in five weeks, at three different distances in three different states and against a rotating array of competitors, is roughly akin to having a football team play three games in a week. Only once in the last 10 runnings has the Belmont winner competed in all three Triple Crown races – that was Afleet Alex in 2005. The more common path to the winner's circle in that race is to sit out at least one of the earlier legs, most often the Preakness, thus providing more rest in between. That's the method I'll Have Another's two most prominent challengers are taking to New York – Dullahan, third in the Kentucky Derby, and Union Rags, seventh after yet another rough trip. 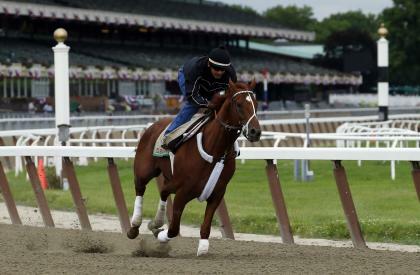 Both those horses turned in eye-catching workouts Sunday in their final tune-up for the Belmont. There won't be much to do for the I'll Have Another camp the rest of the week – routine maintenance jogs in the mornings, plus a long list of appearances and functions and interviews. Anxiety management could be the biggest challenge. By Saturday evening, the hardest three weeks in sports will be over. We'll know then how well I'll Have Another and his human connections handled it all.